This last summer, the H2H American girls and I decided that for our vacation we would visit the island of Crete. We rented a really great house on AirBnB, rented a car and off we went. Our house was a little hard to find, so we first found goat mountain and then three hours later found our actual house! We visited beaches (my favorite was the pink beach, of course), the ruins of Knossos, Chania, Heraklion and we can't forget the Samaria Gorge hike! This is supposed to be pink sand....hard to tell though! I wish I could have ridden this pink Vespa! 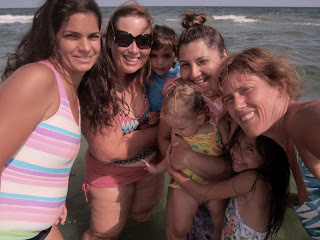 For my second vacation, Jen and I took Ruthie, Karla, Daria and their moms to the Black Sea. We were there for four days and we had lots of fun going to the beach, a dolphinarium and the boardwalk by the beach. Fun in the Sun!!! Oh, very jealous I have a dream that I want to take my parents to this trip. To be as happy as I can.